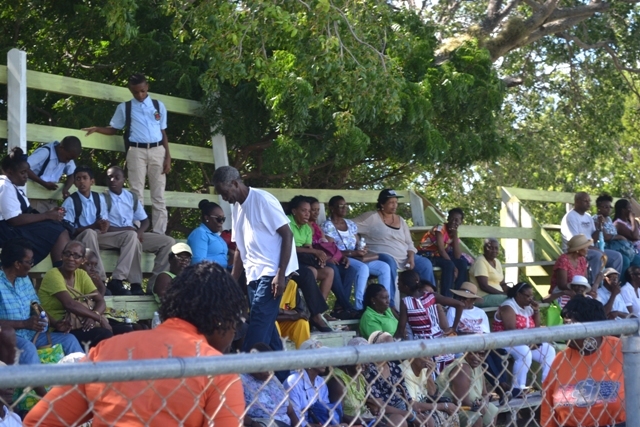 NIA CHARLESTOWN NEVIS (OCTOBER 19, 2015) — Nevisians descended on Elquemedo T. Willet Park (ETW) in their numbers on October 15, 2015, to witness the first ever Seniors Fun and Action Games hosted by the Ministry of Social Development, Senior’s Division. 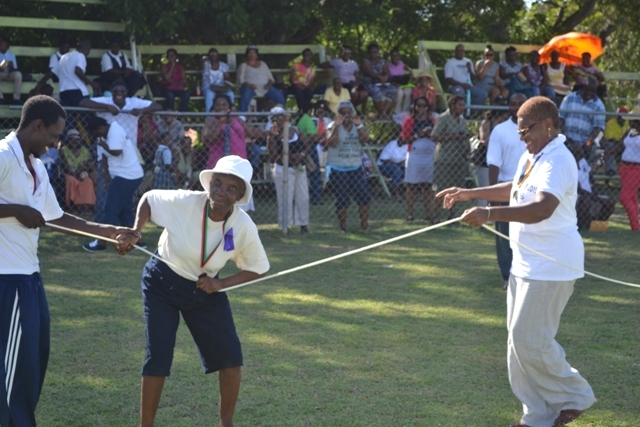 The theme was “Promoting Mental and Physical Health Participating in Seniors Fun Games”. 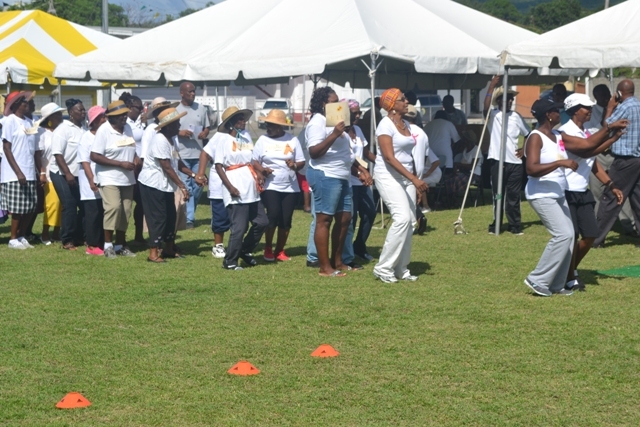 The event was held under the patronage of Meredith Amory-Field, in collaboration with the Mental Health Unit, the Nevis Red Cross and the Gender Affairs and Sports Divisions. 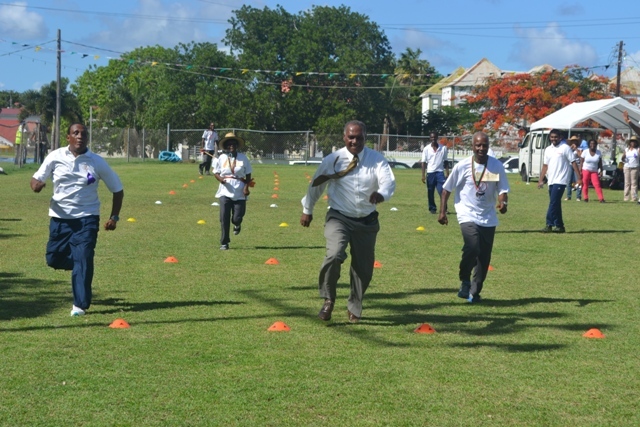 Many of the stakeholders involved in the Games, expressed their elation. The games were marked by a number of “falling” participants, who nonetheless got up and finished the race. One such senior was Ms. Gweneth Maynard, who had already amassed four medals. She toppled over during the Thread the Roll Race but got up and finished in second position. She proudly displayed her medals while announcing that she placed first in two of the events and second in two other events. Likewise, Annie Brandy also fell but undauntedly finished the race in 2nd position. She exclaimed that the games were a wonderful event. The seniors’ stamina knew no bounds, as everyone participated amidst much camaraderie and cheers from the spectators. In the midst of such good spirits, Mrs. Olvis Dyer contended that the Fun and Action Games was a good activity and it encouraged integration of seniors into the society. Another senior commented that it was a good way of bringing the island’s seniors together instead of them staying at home and staring blankly at the roof. 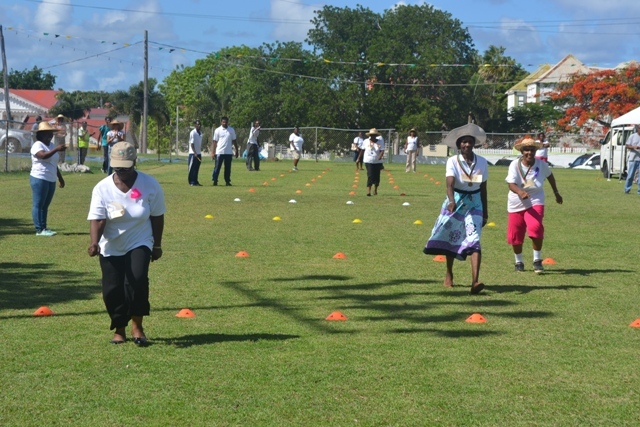 Caregiver for the Hanley’s Road community, Ms. Briony Dore thought that the Games was good for the seniors based on the positive health benefits that can be derived from exercising. Meantime, initiator of the Games Amory-Field, noted that everything had gone as planned especially as all of the invited guests attended the event. She added that she was particularly cheerful as one of the seniors Ms. Sheila Brookes, despite her hearing impairment and physical disability participated successfully in the activities. She expressed satisfaction that generally, the seniors did not allow their disabilities to mar their fun as was demonstrated by 95-year-old Liza Liburd, whose performance far exceeded the expectations of a visually impaired choreographer. Ms. Amory-Field was optimistic that the sports event would not only be annual but that it would be marked by a public half holiday. Also present to witness the opening of the landmark activity was Federal Minister of State responsible for Health and Social Services in St. Kitts Hon. Wendy Phipps accompanied by a group of seniors. She announced that the cordiality would be returned as Nevisian seniors would soon join their Kittisian counterparts in some of their planned activities. Also present was Deputy Premier and Minister of Health Hon. Mark Brantley, Permanent Secretary in the Ministry of Health Nicole Slack-Liburd and the Permanent Secretary in the Ministry of Health in St. Kitts Andrew Skerritt.